The Jaguar Bass is totally unique, both as a playing experience and in the sounds it generates. There is little point in bringing out a great new bass that just sounds like the rest of the range, so it's great that the originators of the bass guitar can still come up with the goods. You can accidentally turn the bass off with the pickup switches. Pickup blending is not really an option. It is unfortunate that Fender's early policy of supporting their guitar models with a sympathetic bass design apparently stopped short of the Jaguar. While the Telecaster introduced the stirrings of the original slab bodied Precision, and the Stratocaster the more luxurious contoured body for the same, the Jaguar failed to have a bass directly associated to it. Although it inspired elements of the design of Fender VI six-string bass, as regularly used by Jack Bruce, it's taken over 40 years for a true four-string version to materialise. An amazingly eye-catching design, first impressions are extremely positive - albeit with a sense of entering a time warp. Much of that is due to the tasteful selection of traditional parts like the vintage-styled bridge, the creamy aged look to the scratchplate and the classic open-gear tuners. Add to that 'aged' lacquer on the neck and the seemingly discoloured pearloid block inlays and the reissue illusion is complete. Only two pickups here though and it doesn't take long to realise that the general design is a neat combination of the body and scratchplate from the original Jaguar guitar and the bridge, pickups and neck from a Jazz Bass. Cross-pollination of design and hardware is an idea used by Fender many times over the years, and although not all of the resulting hybrids have found favour with the musical populous, this particular one has to be declared a total success. Without doubt the alternative black finish body also looks dead cool but, for us, this vibrant hot rod red colour with matching headstock is mouth-watering. Ironically for such a backward-looking design it comes loaded with the very latest in active bass circuitry, as well as a heavy slice of traditional electronics. As it happens, thanks to the over indulgence of switches and knobs on the original Jaguar guitar, there are loads of wiring options available without having to fit clumsy push/pull pots or extra micro switches. This has got to be one of the most effective designs ever to encompass so many controls. The use of three separate chrome plated control panels is incredibly neat so no wonder the result is visual bliss. Taking another leaf out of the Jazz book, the Jaguar has an ultra slim, maple neck that just seems to disappear beneath the hand, but as far as the overall feel of the instrument is concerned, this is a very different playing experience. It's certainly comfy to use, particularly when standing, even though it is very slightly headstock heavy. String spacing is very generous and the use of the original bridge design with threaded saddles is an unexpected bonus. That, along with the traditional open gear tuners, is so much a part of the Fender bass legend so it's good to find both here. In spite of being endowed with a pair of Jazz pickups, plus a physical similarity of positioning, the complex active/passive circuitry ensures that the Jaguar bass has a sound all of its own. Admittedly, there's a serious amount of understanding required regarding these electronics, so much so that Fender has sensibly included a diagram to explain the function of each knob and switch. However, once examined it reveals a logical way of categorising the controls between the three metal plates. The upper plate houses the active circuit on/off switch and the corresponding active treble and bass controls. The regular rotary controls are for master tone and volume and the triple-switch plate activates the individual pickups, presenting the series/parallel slide switch. What is immediately obvious is that there is no way to actually blend the output from the two pickups so there are no really hollow sounds to explore. Although this may seem like an oversight at first, the reality is that if you want that hallowed bass sound then you're obviously going to get a Jazz Bass. There are three distinctive qualities to the sound of this instrument. With the series switch at off the passive circuit produces a variety of sounds from both pickups thanks to the effective master tone control. Turning the series switch on warms and fattens things up, but when you kick in the active circuit the Jaguar releases its roar. Once you've engaged the powered electronics it's hard to look back. More attack, presence and delivery plus heightened definition and tonal warmth, is all most impressive. But it's having the choice that makes this such a worthwhile design, and as this sounds like no other Fender bass there are a lot of positives to consider. Having all the right features of a great classic bass it's amazing to think that, until it rolled off the production line earlier this year, the Jaguar Bass never existed. 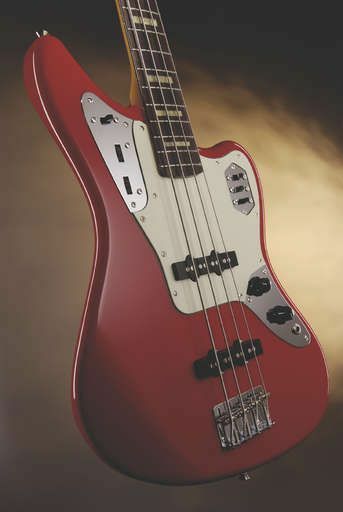 Being endowed with so many classic Fender features, the Jaguar bass has almost designed itself. It certainly feels more like a classic reissue than a brand new model and we heartily applaud Fender for finally getting the thing off the drawing board.